I took a short trip to Tacoma to visit the Madrona Fiber Arts Festival. I could only stay for one night, so I packed in all the fun! I had two classes. 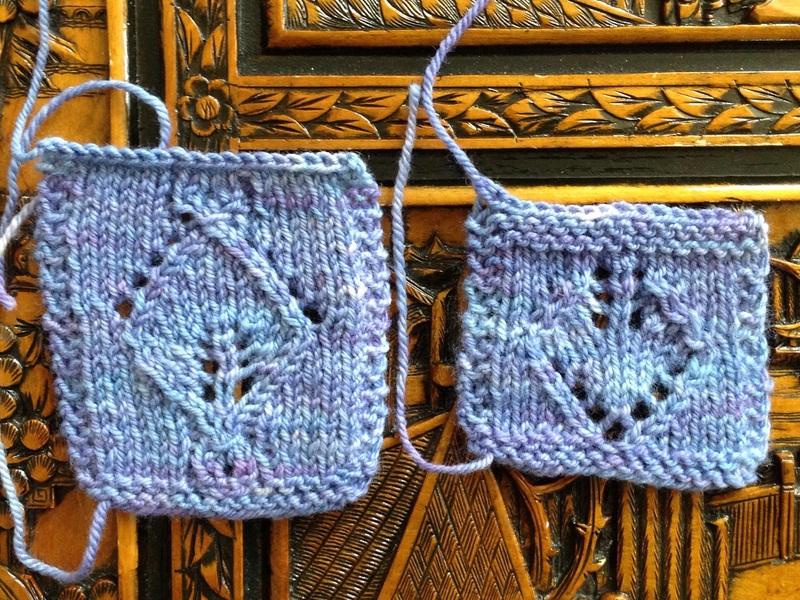 My favorite was Designing with Lace Decreases with Evelyn Clark. The very first lace shawl I ever knit was her Shetland Triangle, so I was very pleased to be in this class. 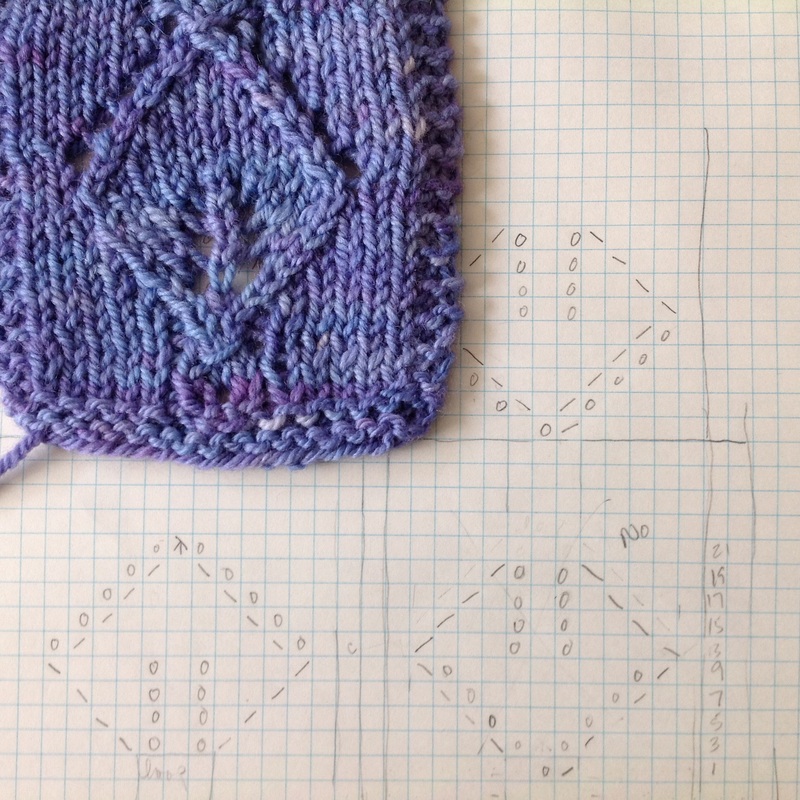 Where do the decreases belong, in relation to the yarn overs? Which decrease should you use? Well, it depends on what effect you want. So much information packed into this little swatch. Notice that it does not mirror from left to right; we had lots of effects to sample! Do you want your decreases to outline your YO? Or a softer edge? Do you want your fabric to bias? (Separate your YO from your decrease.) If that biasing bothers you, consider a project in the round, which will balance out the biasing (as opposed to straight edges that won’t stay straight). Evelyn had lots of samples to look at, and to explain. One thing she mentioned: Scallops are always stronger at the cast on edge than at the bind off edge. I’d noticed this when I designed my Rockaway Hat/Cowl, and it didn’t matter so much in that instance, but it was nice to know it wasn’t just me. 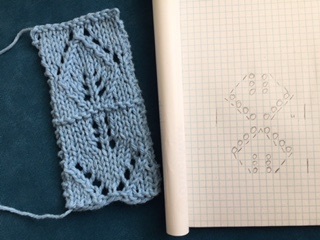 (I could have swatched, but I just knit it up and said, “Oh, hey.”) But if you want to reinforce the scalloping at the bind off edge, you might try adding beads for weight there. Or forego scallops completely, and end with something else. Also, scallops are going to be offset by half a repeat (they won’t look the same at each end of your knitting) because the peak and trough of each wave is offset. We were given the option of charting out a picture, just for fun. 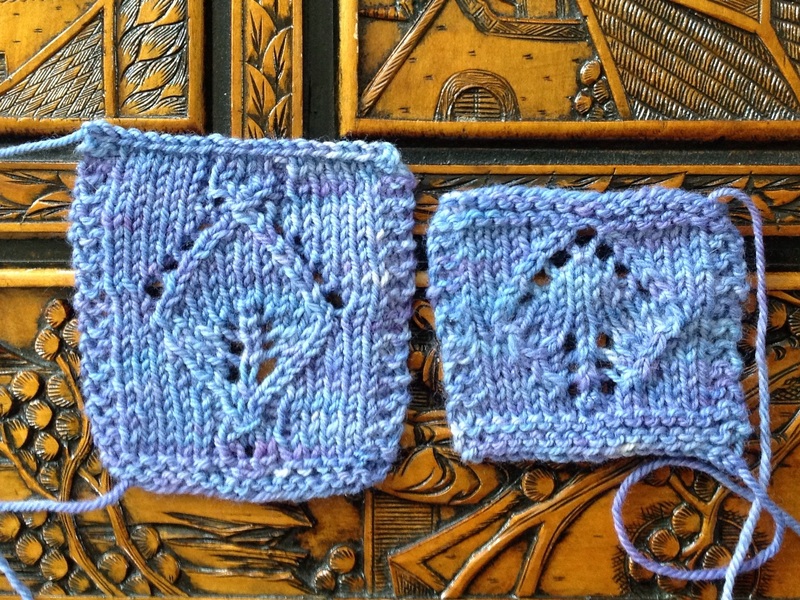 We talked about flipping lace motifs to knit them upside down (for top down knitting). I tried it with my leaf motif that I used in Garland. I showed it to her at the end of class, and she said that some motifs won’t work upside down, and she thought that my leaf might be one. I tried to knit it that night, but I fell asleep, so didn’t finish the flipped one. But in my email the next morning, I found one from Evelyn, saying that she had thought about it, and knit it, and it really didn’t work. She sent me a picture, and it looks like an arrow! You can’t see the decrease lines at all (bottom of swatch, top chart). That, my friends, is a fabulous teacher. I had to figure out if there’s another way to make it work. It is completely different; I just wanted to know if I could. And that’s the mark of a great class, for it to be so thought provoking that you just have to figure it out. I had to use m1 increases and double decreases to get the lines to show up. It’s not pretty, but I just had to see if it could be done! 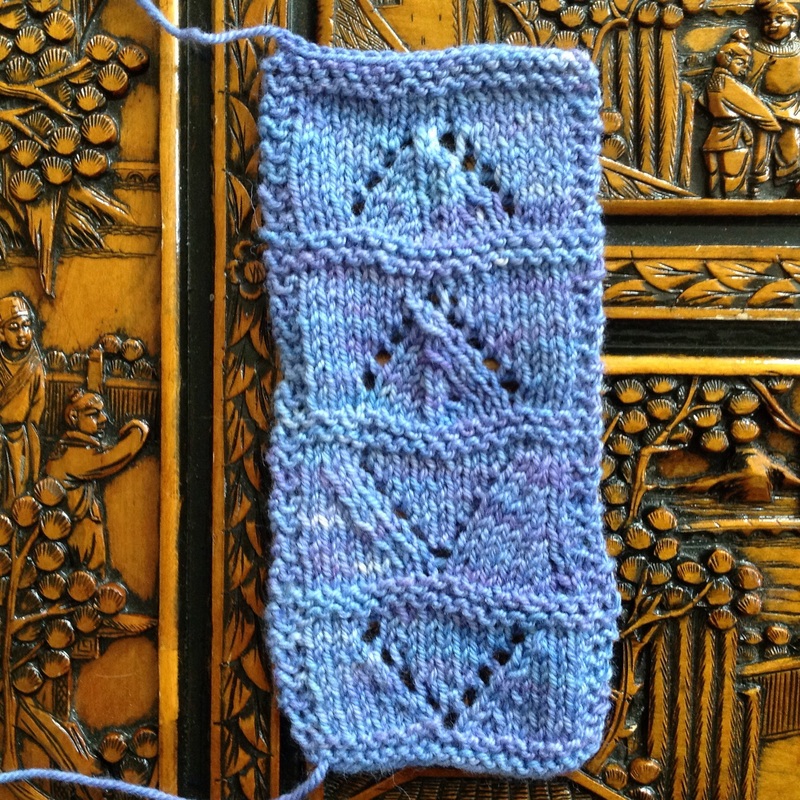 Evelyn called this playing with lace “nerd knitting” and I am completely nerding out here. But it was fun. This post is way longer than I anticipated…more in the next one. This entry was posted in classes, events, Knit and tagged evelyn clark, lace knitting, Madrona, madrona fiber arts, Madrona Fiber Arts Festival, nerd knitting. Bookmark the permalink. There isn’t much better than nerding out over the stuff you love. This was all very interesting and elucidating. Thanks for sharing. And I love that there are people who understand what it is that I’m geeking out about! Lace is endlessly fascinating. That class sounds like fun! I always wish I had more time to do “geek knitting”. You’ll just have to come over and geek out with me! Did you make any Korknisse yet? They’re addictive! Wow. It sounds so interesting! I would love to get to a class like this one day. I liked seeing your experiment too.